Rossville Georgia – Let's Go RVing! Wow – what a night and what a day. Jerry woke me up last night snoring and I could not fall back asleep so I had to wake him up. He moved to the sofa. I woke up about 6:15 freezing! I didn’t want to go into the den to turn on the heat because I knew Jerry had had a bad night and I didn’t want to wake him up so I stayed in bed cuddled up until nearly 7:00. I finally couldn’t stand it any longer so I got up and quietly went in the den. It was dark but I tried to turn on the heat only to turn on the air condition. I finally got a flashlight out of the cabinet and then – Jerry asked if I needed help! After a cup of coffee I got back in bed trying to get warm and listened to a podcast and fell asleep again. Finally got back up about 8:30. We sat around and talked about future trips, saving money, what we were going to do today, etc. We finally decided we would go downtown Chattanooga and take the Chattanooga Ducks Tour. I called about 10:45 and they said they only had vacancies on two trips today, one at 11:30 and one at 3:30. I asked him if we could get there by 11:30 and he said sure but to take an alternate route because of the parade. I explained that I would be using a GPS so he told me how to get there. We left immediately and had no trouble getting to downtown but then had to find a parking spot in the midst of a lot of traffic. We finally found one near the waterfront and very quickly began walking to the tour. He had told me that he was behind a cupcake store so we found it fairly easily but it was a hike. The ride was great. It was an authentic renovated WWII amphibious landing craft that could go on land and water. 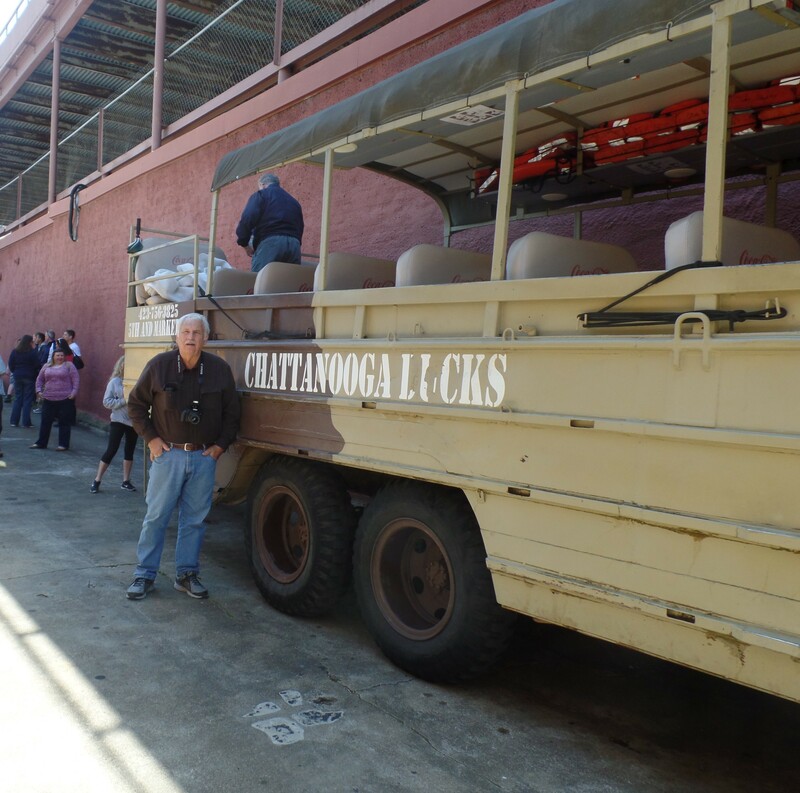 The guide was very knowledgeable and knew a lot of history about Chattanooga. He recommended walking the Walnut Street Bridge, Coolidge Park and the aquarium. We rode along Ross Landing and on to McClellan Island all the while hearing a lot of history. To go from the street to the Tennessee River and then back to the street was fascinating. It was windy and a little cold but a great experience. By this time we were hungry and the guide had recommended several restaurants which we passed right by as we walked today the car to get our Adkins bar and water. One of our topics of discussion this morning was saving money on our trips and we admitted that we were eating out too much. However, if it had been left up to me today we’d have gotten something better than an Atkins bar for lunch! After our “lunch” we walked over the Walnut Street Bridge. The 2,376 foot span is one of the world’s longest pedestrian bridges and connects Chattanooga to the North Shore. 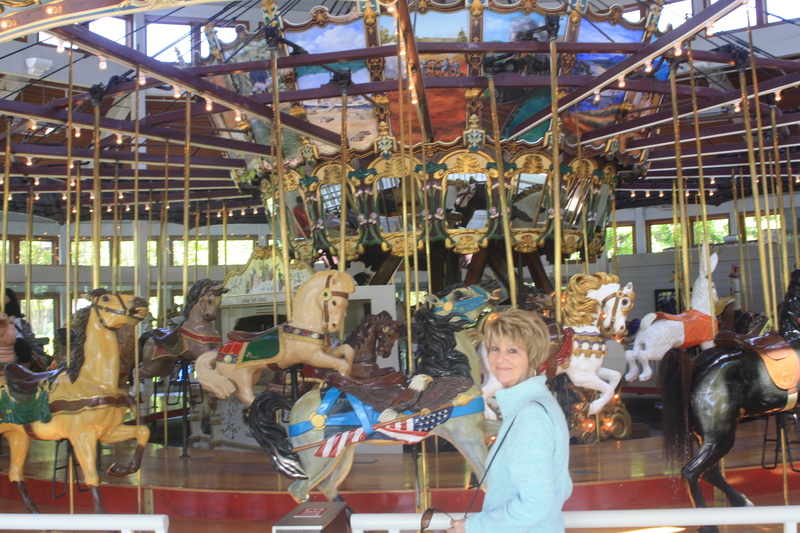 On the other side was Coolidge Park and a beautiful carousel that was donated to Chattanooga from Atlanta after Atlanta got a new one. Atlanta however didn’t send any horses, etc. so a master carver, Bud Ellis instructed a team on how to create all of the rides. We walked back across the bridge and then went to the Tennessee Aquarium first to the salt water side. The first thing we saw were the penguins and they were so cute. They were all banded so that the handlers could tell them apart. After a tour of the salt water we went to another building to the fresh water side. It was much larger and had many fish of all sizes and descriptions and from all parts of the world. Returned to the RV a little after 5:00 exhausted. Fortunately we were eating meatballs and leftover veggies. I cut up a cucumber and we ate about 7:00. Although really tired Jerry bagged up the trash and we took it to the container. As we were walking back we ran into our neighbors from Durham, Jim and Barbara Hastings and ended up standing outside and chatting until 9:00. Inside now and Jerry is continuing to watch the football draft and I’m off to bed.